Fill in your details correctly & completed entries will only be considered as 'VALID' participation for contest. You can predict your score/rank/percentile multiple times for a single exam before contest date for that exam ends.Your last entry will only be counted as your eligible participation for that particular exam. Qualifying rank for JEE Advanced is between AIR 1 to AIR 20000. Qualifying rank for JEE Main is between AIR 1 to AIR 100000. Qualifying score for JEE Main is between 150 to 360 marks. Qualifying percentile for JEE Main is above 80 percentile. Qualifying rank for NEET is between AIR 1 to AIR 50000. Qualifying score for NEET is between 450 to 720 marks. Qualifying rank for AIIMS is between AIR 1 to AIR 5000. Qualifying score for AIIMS is between 110 to 200 marks. A contestant is only allowed to submit 2 different predictions i.e. 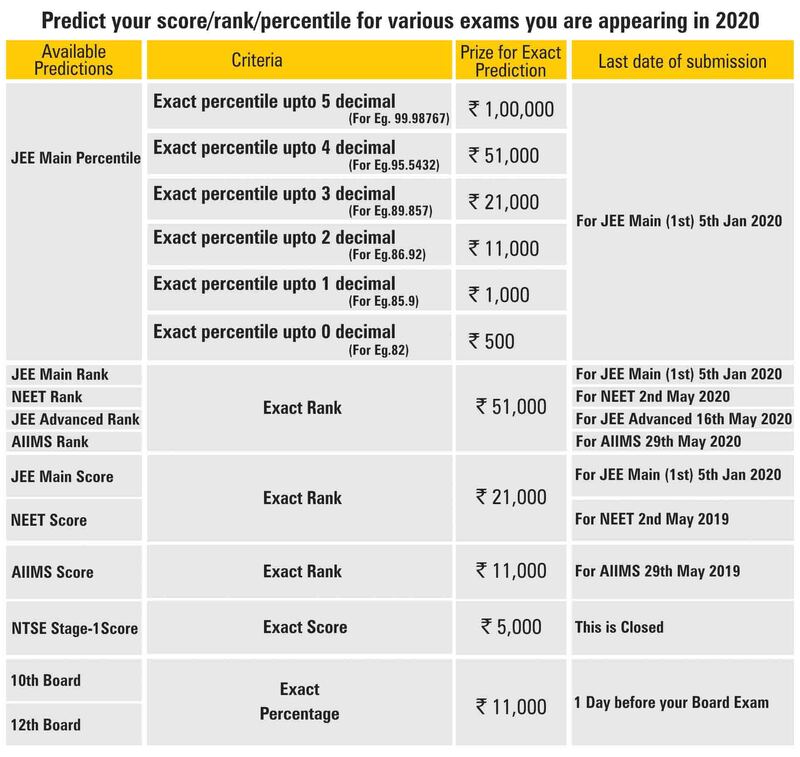 if a contestant has predicted his JEE Main score then he can again enter the contest for JEE Advanced Rank, JEE Main Rank or 12 Board percentage (current year appearing only). All winners have to verify their actual result by presenting official documents of Rank / Score / Percentile at Motion Corporate office 394, Rajeev Gandhi Nagar, Kota 324005 within 20 days of results announcement for predicted exam. Winning amount is different for all the exams, please read below mention prize chart carefully. At time of verification please bring original copy of your Aadhar Card. After declaration of result of exam predicted by the participant, participant has to visit motion.ac.in/predict-and-win and login with his credentials and claim the prize to declare his winnings in the contest. If a participant does not claim it within 3 days of declaration of the result than he/she will not be considered as winner for that contest. Total amount of prizes to be distributed is Rs. 500000 only and will be given only on claiming it on FIRST COME FIRST SERVE basis. In case of any dispute, Motion Education Pvt. Ltd. reserves all rights as the final decision making authority. Exact Prediction of your percentile will lead to prize money of Rs 1,00,000 and Certificate of appreciation (For Rest of The Prizes Refer - Prediction Table Chart). Exact prediction of your rank will lead to prize money of Rs. 51000 and Certificate of appreciation. Exact prediction of your score will lead to prize money of Rs. 21000 and Certificate of appreciation. Exact prediction of your score will lead to prize money of Rs. 11000 and Certificate of appreciation. Exact prediction of your percentage will lead to prize money of Rs. 11000 and Certificate of appreciation.